Let’s review what the PMBOK® Guide says on this subject. Accuracy is an assessment of correctness. For example, if the measured value of an item is very close to the true value of the characteristic being measured, the measurement is more accurate. Precision is a measure of exactness. For example, the magnitude for each increment on the measurement’s number line is the interval that determines the measurement’s precision—the greater the number of increments, the greater the precision. Who defines the desired level of Accuracy and Precision? The project management team should determine the appropriate levels of accuracy and precision for the project in the quality management plan. There is no fixed value or standard for accuracy or precision that apply for all projects or industries. In simple terms, Accuracy means that values are very close to the true or target value. Precision means that values have very little scatter (very close to each other). Precise values are not necessarily accurate and vice versa. Let’s take this example in a quiz format. Your office starts at 8:00am. Arriving to work after 8:15am is considered late. You take a subway train to commute to work. Usually you board the same train every (working) day that departs at 7:30am. Barring any unusual circumstances, you report at work between 8:22am and 8:24am every day. Which of the following is true regarding your reporting time to work? Your office starts at 8am and you reach between 8:22am and 8:24am every day. Your arrival time is always within the 2 min window. In other words, your arrival time has very little scatter, which means it’s very precise. However, the true or target value is 8:00am. Your arrival time is 22-24 mins away from the target. Therefore, you are “not” accurate in terms of arrival time, particularly when your company considers arriving after 8:15am as late. Now let’s twist the situation a bit. What if you arrive at work between 7:32am and 7:34am every day. Does that make you any more accurate? The answer is - No. Now you may argue that arriving at work early every day makes you accurate (and makes your boss happy) but in statistical terms, you are still “not” accurate because you are 26-28 mins away from the target value of 8:00am. Let’s use an example from Archery to further reinforce the concept. Your aim in Archery is to hit the innermost ring (red or green ring) for 10 points. The score decreases with each ring going from center to the edge of the board. In 4 rounds of 5 shots each, your scores are listed below and shown in the image. 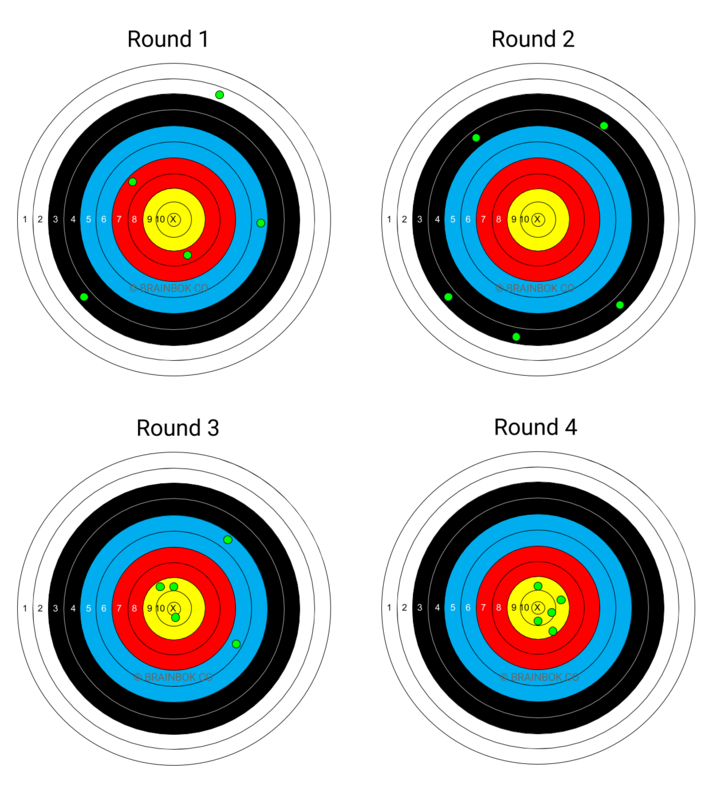 Both 10 and X (bull’s eye) are scored as 10. In which round were you precise, but not accurate? Round 2, because the values have the least scatter. 4 of the 5 values hit the 7 point ring. In which round were you accurate, but not precise? Round 3, because the values are closest to the target value (10) but still hit 4 different rings. In which round were you neither accurate and precise? Round 1, because the values are all over the place with lot of scatter and significantly away from the target value (10). In which round were you both accurate and precise? Round 4, because the values are close to the target (10) and always between 9 and 10. And it goes to show that practice makes perfect! This is an example that I usually use for project management students and PMP certification aspirants. In this example, the values are on both sides (below and above) of the target value. Line 1: Neither precise, nor accurate. Line 2: Precise, but not accurate. Line 3: Accurate, but not precise. Line 4: Both accurate and precise. Which is more important - Accuracy or Precision? Before we close, I thought I should address this burning question that I had at one point and I’m sure some of you may have too. By intuition some may say that Accuracy is more important than Precision, but that’s not true. Let’s extend our office example and say that you arrive to work between 7:45am and 8:15am on Mon and Tue, and between 8:15am and 9:00am on Wed, Thu and Fri. You are certainly more accurate on two days, but overall your arrival time is much less predictable compared to the earlier example. If you were my direct report, I would rather have you arriving between 8:22am and 8:24am every day so that I know precisely when I can you find you at your desk. As you can see, there’s no hard and fast rule when it comes to Accuracy and Precision. As mentioned above, the project management team decides the appropriate level of Accuracy and Precision desired on their project. Generally speaking, a good balance of Accuracy and Precision is desirable. To summarize, Accuracy is about values being close to the true or target value, whereas Precision is about values being close to each other (less scatter). Precise measurements are not necessarily accurate measurements, and accurate measurements are not necessarily precise measurements. The project management team should determine the appropriate levels of accuracy and precision for their project in the quality management plan. I hope you found this post useful. Please share your feedback via the comments section below. I would love to hear your questions and comments around this topic.